Before I start this article, no one has to fly to Iceland - unless they want to. Siggi’s is a brand of yogurt that is made in the United States BUT is Icelandic style. It is made by incubating skim milk with live active cultures and then it is strained to create a thicker, creamier, concentrated yogurt. Remind you of anything? Yes, it is very similar (if not almost the same) as Greek yogurt. The main difference between siggi’s and the rest of the bunch (FAGE, Chobani, Dannon, etc.) is that it has less sugar per serving. Instead of 18 grams per serving, it has 11 grams and this, my friends, is Snack Girl’s Shangri-la of yogurt. I have complained and complained about the amount of sugar in commercial yogurt and someone in Iceland heard me. The amount of ADDED sugar is about 5 grams because yogurt already has natural sugars. Five grams is about one teaspoon so I find this to be the right amount. How does it taste? 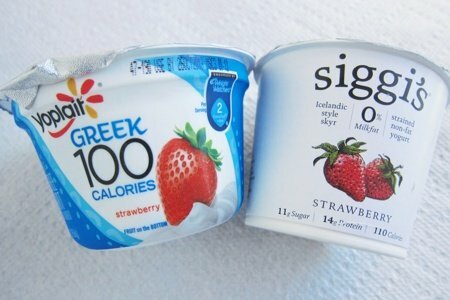 If you are used to a brand such as Yoplait Greek, siggi’s is going to taste very sour. Yoplait Greek has only 9 grams of sugar but they added sucralose to make it sweet. I find it to taste cloyingly sweet (too sweet for my taste buds). With siggi’s, you get 10 more calories but you also get 4 more grams of protein. Also, no sucralose and it’s texture and flavor are superb. Obviously, my recommendation is to buy siggi’s but there is a major cost difference between the two. Siggi’s runs about $2 at my Stop & Shop and Yoplait Greek is $1. What to do? If you have the dough, buy siggi’s. If you love Yoplait Greek – don’t let me stop you. Look over at the siggi’s every once in a while and see if there is a sale and give it a try. Have you tried siggi’s? What do you think? Siggi’s yogurt was received for review consideration. No other compensation was provided. Points+ values are calculated by Snack Girl and are provided for information only. I love Siggi's! It takes some getting used to - in addition to not being as sweet, the texture is more grainy. But it is a power snack. It really fills you up. Basically Siggi's is yogurt for grownups. It also has more sophisticated and interesting flavors. I was surprised (because my tastes don't always run "grown up"), but I loved the orange and ginger flavor. I love Siggi's yogurt as well-great texture and taste. My kids just started eating the siggi's tubes (raspberry flavor is their favorite)-what a great snack! I live this post! I'm going to try Siggi's and see how it is. I an a Greek yogurt freak and if this one is healthier, I'm in! Thanks for sharing! I have to admit that I LOVE Dannon's Blended Greek Yogurt, Toasted Coconut flavor. I'll happily eat this yogurt and haven't been too much of a yogurt fan before. It satisfies my sweet tooth. I know it has artificial sweetener in it, but it's so delicious and has a nice amount of both protein and calcium. Don't think I could get used to a yogurt that's on the sour side. Are the two containers the same number of ounces? They look like they might be different. Thanks for any info! I was eating Siggi's when this came up in my RSS feed . . . big big fan! I find it keeps me feeling "full" or at least satisfied longer than other yogurts, so I can make it to lunch without a snack! I love Siggi's yogurt. It's actually my favorite, I enjoy the orange ginger & the pomegranate passion fruit best. I am staying with my Fage----love the taste and texture-- I add my own fruit to it. 130 calories,85 sodium, 0 fiber, 9 carbs, 9 sugar, 23 grams of protein and no fat. My nutritionist turned me on to Siggi's as a healthy low carb snack to help keep my blood sugar in check. I love the vanilla. Real yogurt is supposed to be a little bit sour! I personally make my own yogurt at home. It's super easy. I am too lazy to strain it plus some of the nutrients are lost with the water, so it's not as thick, but it's good nonetheless. Recently I bought some commercial yogurt and was shocked by how sweet it tasted even though it was "plain". This is not natural! I eat plain 1% yogurt - 100 cal per cup. No added sweetner at all I just add my fruit of choice. So the calories do go up with the fruit but you only need a bit and it is good for you too! Just like Deni said - yogurt is sour naturally. You can add vanilla or maple syrup for flavouring but I love it plain! Beth B I agree, that toasted coconut vanilla is what I eat every morning (never was a yogurt fan) but I add 4 Tablespoons of crushed pineapple. I might have to get one of these to try but not sure it will even compare to what I'm used to. I haven't seen Siggi's at our grocers. I'll have to look for it. I'm not sure I'd go for grainy but less sugar--yes. I love Siggi's! And they come in a grab and go tube form(like gogurt) which is great for the mornings. Siggi's vanilla is 2 WWP+. I eat it every morning with 1/2cup of Kashi GoLean. That 4 point breakfast keeps me going all morning! Any thoughts on goats milk yogurt? I know it is more costly, but has less sugar and is very tasty. I LOVE Fage. I'm willing to try Siggi's. I do not like yoplait "greek"; I think it is because of the gelatin. I might like the slightly grainy texture of siggi's because that is about the texture I get in homemade yogurt from pastured cows. I love Siggi's! So good. So $$! I have a hard time finding it when I'm out of the city (I live in the city but commute to spend half the week in a small country town that ain't ever heard of Siggi's!). Glad to hear someone (you Snack Girl) agrees with me on the ridiculously large amounts of sugar in yogurt. Will have to give siggi's a try. I have to admit that I saw the young man who brought Siggi to the U.S. on an interview on T.V. I was charmed and impressed. I wanted to run out and buy this yogurt right away! Alas, my town is so small and it is not here yet and I am not aware if it contains the live probiotic cultures that I desire. No problem, I make my own yogurt. I make Filmjolk, a Scandinavian yorgurt probably very similar to Siggi in flavor, very tart. Not as rich in probiotics as Fage type yogurt. It can be made on your countertop at home without a heating device but it is not as thick as Greek yogurt, in fact it is much thinner than regular yogurt. It is mesophilic (heating device not needed). I also make yogurt from Fage plain flavor that is thermophilic (needs heat). It is easy to make especially in the summer. Now that it is cooler a seed mat or reptile heating mat will be necessary to make my probiotic yogurt. Also, there are devices on the market to make thermophilic yogurt if you don't mind yet another appliance taking up counter space. People have found that heating pads, slow cookers and a heated oven or hot water bath will work well also. Homemade yogurt is so delicious and it gives the consumer control over everything that goes into making it. Truly, it is so easy, inexpensive and rewarding. Siggi's is absolutely the best! Those other yogurts are way too sweet for me and I don't want any GMO sweeteners. I'm definitely going to try Fage but I absolutely adore Siggi's. I thought I was the only person on the planet who knew how good it was. It is hard to find. Giant in my town has a few flavors in their organic section. It's not as sweet but it goes down great! I'm not there with making my own yogurt - but I aspire to do it some day. When I can't get Siggi's I eat Chobani, I opt for the 20g carb flavors or less. Watch out for the cherry chobani because it's 4 ppl as opposed to 3 ppl. One of the best benefits of going on a weight loss plan is I got to try and enjoy some delicious yogurt!! Thanks for asking Snack Girl. Siggi's is great. I have found one brand I like better of Skyr called Smari..so tasty. My Stop & Shop stopped selling it:-( Not sure why. Actually, here's the secret - it's not yogurt, it's skyr. And while also based on a bacterial culture, it's more similar to cheese making (requiring some rennet) than yogurt making and thus, is done with skim milk. Siggi's all the WAY! I don't know how anyone can eat yoplait greek yogurt - bleck. I've tried this yogurt in the past and liked it. Now I enjoy Silk soy yogurt. Peach/mango is delish! I enjoy the siggi's but Fage's texture wins out for me every time. I want to love Siggi, I REALLY do, but honestly, I think it's GROSS!!!! I purchased it one day when I was out shopping and wanted to eat something healthy, so I bought it and got a spoon too. It was simply AWFUL - however, I did buy PLAIN - as I buy Fage Plain too. I can handle Fage Plain 0% fat, but I could NOT get down Siggi's plain. It was too thick! Food with real ingredients is worth the extra money to me. I also like Noosa, which is sweeter, but more expensive! But you need a treat now & again, right? Thanks for this review! Do you know if it is non-GMO and/or organic? Absolutely love Siggi's! All other brands I've tried have way too much sugar. Yes, Siggi's is more expensive, but if you care about what you put into you bodies - Siggi's far surpasses the rest. I even love the labeling/container - they make it so easy to recycle properly. I swear by Siggi's now...will occasionally eat other brands of Greek yogurt, but I think Siggi's is the best. I have to echo the comment about the orange/ginger flavor, it is so good. I love Siggi's. I found it by comparing the sugar content of different brands of yogurt and yogurt-like products. Siggi's has the most protein and the least sugar. It has live cultures and the milk comes from grass-fed cows. It is very thick and not as sweet as yogurt, but far healthier in my book. They just came out with a Pumpkin and Spice flavor for the season! I like Siggi's, but Icelandic-style yogurt (skyr) takes some getting used to - def not the same as Greek. At first, I felt like I was eating Pond's cold cream! But yeah, once you get used to it, it's good, and the lower sugar is a big plus. Admit that it took awhile to get used to the "sour" taste of Siggi's but now that I am, I am hooked. Most other yogurts just taste too sweet and "gel" like now. I like that they don't supplement with artificial sweeteners. If I am looking for more sweetness, I'll throw some berries into the cup with the yogurt. If you think it too grainy (I don't), try Siggi's new 4% yogurt ... not low fat but it is creamier. Siggi's is great stuff imho and I hope to continue to see it in the stores. You are wrong about Fage. I eat plain 0% Fage and it has very low sugar content. 5g or less per serving, which is comparable to siggis. I watch sugar and calories but in reference to taste does it taste like or cheese is it sour or is it good.Imu used to cannon light Greek or yoplait Greek light.